Delicious irony in the market for Big Data, analytics, and business intelligence (BI): "there's way too much data [and confusion] about Big Data." 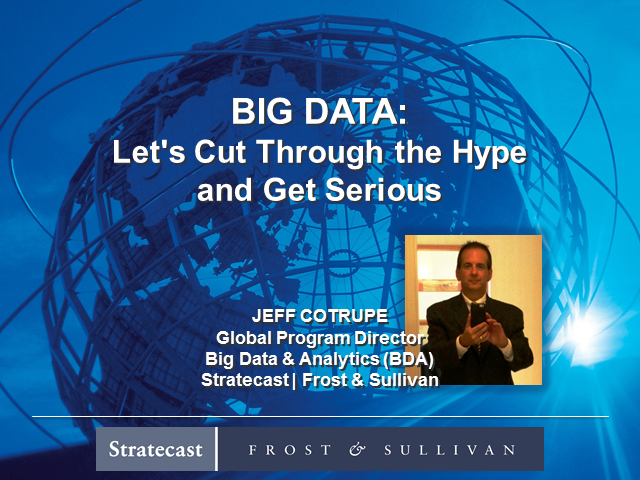 Jeff Cotrupe is here to help cut through the clutter and get down to specifics and help map out a strategy for what you need to be doing about Big Data--right now--to make sure you cover all your (data) bases and really get the most out of your data management investment. That includes things such as systems monitoring and management, to keep that Big Data flowing and help IT respond to infrastructure issues. Actually, there is; it doesn't take more than a quick web search to see that several organizations have been splashed across the headlines for IT security breaches and have lost millions in sales and damaged brand equity. With attacks becoming increasingly sophisticated and more financially motivated, you must not only protect against such attacks but be able to remediate them on-demand. You also have to contend with a complex mix of corporate and employee-owned devices - smartphones, tablets, servers, ATMs, kiosks, PCs, Macs and more that operate both on and off your corporate network. Join this webcast discussion with senior security experts and find out how you can mitigate risks by securely managing any device, at any location, any time. The time has finally come for Microsoft to cut the cord on supporting WinXP leaving organizations who do not upgrade as open targets to hackers who could exploit vulnerabilities in expired devices. Recent studies indicate that IT downtime not only has serious security implications but can also cost $1M per hour. Now imagine a world where you have immediate visibility into the status of every device connected to your corporate data and can apply patches and security fixes before problems arise. If you work on the front lines of managing laptops, desktops, and servers, you know a real-time solution that could tell you the state of endpoints in seconds--instead of days or weeks--while reducing downtime is critical. The good news is you don't have to imagine anymore--that day is here. Your endpoints don't need to have an XPiration date! Join this webcast to learn how IT can tell you the status of your endpoints in seconds while securely managing any device, at any location, any time. Join Mike Gare to hear more about how to simplify security configuration management and automation for servers. IBM intention to share the details of a our exciting solution comprising our best-in-class automation and security configuration management capabilities - all leveraging the BigFix platform. That means a single agent, console and server to provide a comprehensive offering for Data Center Ops and IT Security Professionals - all at the lowest TCO. Michael Gare is a Product Manager with more than 20 years of experience with global organizations including Computerland, Nortel Networks and IBM. Mike has a broad range of experience in Telecommunications, Mobile technologies, Data Center Automation and Cloud Computing. He has performed a variety of leadership roles, all of which, involved working directly with customers. He is currently a software product manager in IBM responsible for a number of solutions focused on automating the lifecycle management of servers. - Why are we always reactive to database issues? - How can Big Data help? We always asked our math teachers “when will we ever use this again?” Now is the time. As more technologies are being virtualized and processes are being automated, it is becoming harder to maintain a “proactive” support posture. Analytics can help as long as you understand what it does and how to leverage the capabilities correctly. Service management quality policy – measuring service quality and service management capability. A discussion of measurement as the foundation of management – what gets measured gets done – and an approach to the measurement of service quality as well as service management capability. Attend this webinar to find out how we can leverage the data we measure to improve service quality. The state of the art in managing IT has left us increasingly rich in data. We monitor physical and virtual infrastructures. We monitor middleware, applications and end user responses. However, there is far more data than anyone can manually interrogate. Luckily, analytics gives us the tools to leverage this sea of "Big Data" to improve the way we manage it. Sophisticated analytics can provide more and deeper insights, operating only on the data already created as part of operations management in on-premise or cloud data centers. IT Operations Analytics help solve the biggest pain points in service management: predicting and avoiding problems, quickly isolating their root causes, and optimizing workloads across virtualized systems. This Webcast will feature a roundtable of experts in the topic of IT Operations Analytics. They will discuss the state of existing client environments and how emerging analytics technologies can help increase service management performance while reducing costs. It used to be that you could work in IT and understand, to quite a degree, all the aspects of IT. IT has spread and grown now so we work in an area of IT and are experts at that. We have broad awareness of course but only deep knowledge in our own aspect. This has been called creating ‘Mushroom shaped people’. That breadth of meaning in IT now means very different skill sets are required for some different aspects. One massive feature is the need for service management skills. These are not the skills resident in your typical IT geek. But ITSM people are not better – nor worse – than IT geeks. We need both, but we need to recognise the differences. Some of the problems this causes are due to the association of IT with innovation, speed and – let’s be honest – cavalier behaviour. Service management, done well, is logically at the other end of the behaviour and skill spectrum. That end might be seen as the boring end, but that boredom is precisely what most of our customers actually need. As the numbers and types of technologies change, the question of how to monitor them continues. A solid application monitoring strategy can help deal with the unprecedented levels of volatility, uncertainty, complexity, and ambiguity. Taking the time to identify the different ways a technology can fail to perform will help if you have the right process. Once these causal relationships are documented, monitors are created to identify whether a specific cause exists. At a macro level, these relationships and the events generated by the monitors create fingerprints that help identify service-affecting problems. - How to identify "causal elements"
What if you could find a blueprint of the high-level elements to include when implementing an APM solution? If you’re thinking about how to build a sustainable strategy and how it can be anchored into the IT culture, consider starting with a simple APM Methodology. Join Larry Dragich, Director of Enterprise Application Services at The Auto Club Group (ACG), as he presents the foundational elements that go into a successful APM strategy and maps them to a real-world workflow. Each element goes deep as a broad category, and each category encompasses specific monitoring tools that support the end-user-experience (EUE). The times, they are a'changing, in the way you develop your applications, the way you deploy them, and the way you manage them. The application environment demands revenue and reputation protection, the elimination of outages, and cost-savings. IBM's Application Performance Management solutions, long known as a best of breed solutions for managing traditionally hosted enterprise applications, is extending its capabilities for new deployment paradigms - such as public cloud, mobile and SaaS; new user roles - such as DevOps, Cloud Brokers and individual application owners; and even new application platforms - such as Ruby. Tune in to hear how IBM is evolving to meet the ever changing needs of today's application stakeholders and how IBM is helping one company save millions. · The difference between "Designated Leadership" and "Self-Empowered Leadership"
· The leadership qualities that are truly essential to be an effective "Self-Empowered Leader"
At the end of this session you will be able to return to work and make yourself – and those around you – more effective, successful and valuable to your ITSM organization. IT organizations are being pulled in many directions. One side, IT is try to embrace big data, mobile first, cloud computing, and security. At the same time, IT is expected continue improving service levels, cutting costs, and maintaining quality. How do we balance all of these expectations while remaining nimble and efficient? Over time a company’s ITSM capabilities can become siloed and spread out over many different tools that don’t work together. This leads to slow and inefficient processes using incomplete or inaccurate information. This webinar will look at how unified endpoint management and your control desk can work together to integrate processes and data to lower costs and deliver more effective ITSM. See how real-time visibility of your environment can give you the information you need for effective decision making. Learn best practices for effectively controlling all endpoints from desktops to smart phones to servers. Then see how automation can bring everything together to improve end user satisfaction and lower costs. These insights will provide the catalyst needed to advance your organization to the next generation of ITSM. Moving IT from “In Response” to “In Control” requires IT to perform a cultural reset. As an industry, our concerns about security and stability sometimes cause us to isolate ourselves from business change, rather than being the ones that bring innovation into our company to give it a competitive edge. It’s time for a cultural reset in IT. This presentation will look at the culture-induced disconnect between IT and the business. Taking advantage of some “best of breed” IT tools and ITSM best practice can help IT change its game, without sacrificing the control IT needs to secure the enterprise. Opportunities like cloud computing, mobile device management and automated fulfillment will be discussed in context of helping IT to deliver innovative solutions to the business. Listeners will leave this session empowered to begin tackling some of today’s biggest challenges. Like throwing gasoline on a fire - the Cloud is driving the paradigm shift from technology centric to user centric paradigm. From SMB to Enterprise the business has embraced the Cloud and in many cases is actively adopting it. Although the underlying technologies are quickly evolving to meet the driving need - people and processes in many cases are not in place. Whether by choice or not Enterprise IT has to make the leap to break down the silos and embrace new models to meet the growing demands of technology from the business. Join Jeanne Morain - one of the originators of Business Service Management Vision. Ms. Morain will provide prescriptive guidance on the evolution of Service Management in the Cloud, impact on IT causing Cloud Stall, and prescriptive guidance on best practices for implementation of a service portfolio view. Maximize the value IT brings to the business. Gain valuable insights into optimizing the value of your business infrastructures and technology assets enabling greater visibility, control and automation across end-to-end business operations.